In large bowl, stir together oats, brown sugar, baking powder and salt. In large bowl, beat milk, 2 of the eggs, melted butter and vanilla with whisk. Add milk mixture and frozen blueberries to oat mixture; gently stir to combine. Pour into baking dish; let stand 15 minutes. In medium bowl, beat cream cheese, granulated sugar and remaining egg with whisk until smooth. Spoon cream cheese mixture by tablespoonfuls evenly onto oat mixture. 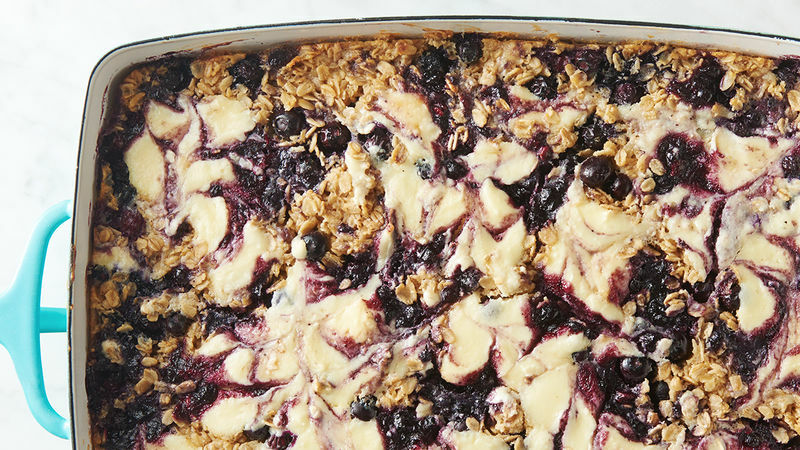 Next to each spoonful of cream cheese mixture, place a spoonful of blueberry preserves. Cut through mixture several times with knife for marbled design. Bake 40 to 50 minutes or until center is set. Let stand 15 minutes before serving. Fresh blueberries can be substituted for the frozen blueberries in this recipe. Letting the oat mixture stand before topping it with the cream cheese allows it to thicken enough so the cream cheese doesn’t sink to the bottom of the baking dish.